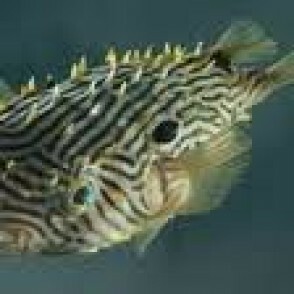 The Spiny Box Puffer is also known as the Web Burrfish. 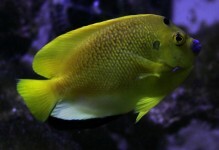 It has a tan to yellow body with dark spots, and short, fixed spines which help protect it from larger, more aggressive fish. Its teeth are actually a fused beak-like structure. 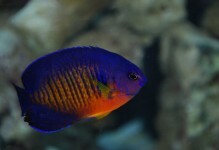 A 180 gallon or larger aquarium is suitable, provided it is a fish-only tank with plenty of room for swimming. 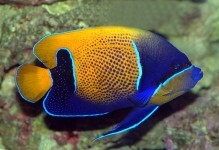 It is known to nip at slow-moving fish and long-finned fish, but is not aggressive with others in its own family. 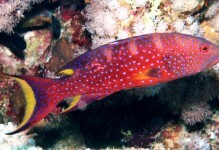 It will eat invertebrates found in a reef tank. The Spiny Box Puffer needs a varied diet of meaty foods including; squid, krill, clams, and hard shelled shrimp to help wear down their ever growing teeth.